I have written about Sonos in this space from time to time. Sonos is a wireless music system that can connect with the digital files on your computer and broadcasts them wherever you want in your home. You can play different tracks in different locations and effortlessly shift from your collection to Internet radio. The software is solid, the user experience elegant and the sound divine. Every few months or so they come out with another great feature. Today it was a version 3.2 of their software. When one hears “upgrade” it properly elicits a grimace. “Am I going to have to carve out my Friday night to get this done?” Not with Sonos. This upgrade is a cinch. They have a one button process that takes care of everything, one step at a time. Imagine no interruptions to “accept the terms.” No “are you sure you want to do this?” It just does it. They add the new controls onto the touchscreen and update your music files so the new features can be used immediately. It all happened in less than five minutes for me and I have over 12,000 songs in my Sonos library. The newest cool feature is the ability to enable song crossfading. Essentially it eliminates the dead air between songs by fading one song out and fading in another song at the same time, as if it was being controlled by your favorite DJ. It works whether you are in you in your own iTunes library or on your favorite Pandora station. This will be great for parties because we all hate “radio silence” don’t we. That’s the awkward space when we actually have to talk to each other :). If you’ve got a big room and you use their S5 music player (built in speakers) you can set-up two and pair them. One as the right channel and the other the left, for a bigger sonic experience. Kind of like Phil Spector’s wall of sound, but without the murder conviction. In addition they’ve added lots of new, free radio stations, Pandora has been integrated for a while now, including news, sports, talk and of course traffic. They have an iPhone application which allows me to sit on my patio and program what’s playing without having another device with me (new software version is awaiting Apple approval). They have also given their alarms more power, with day by day customization. Now you can wake up to your favorite music at a different time each day. And just in case you need it, Sonos is now available in 9 languages. I do have some suggestions. They haven’t worked as hard on categorizing the thousands of radio stations. It seems they rely on the provider to do that. 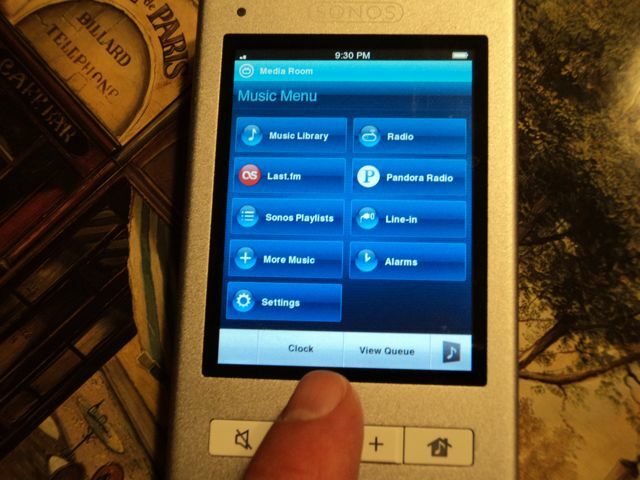 For instance, RadioIO on the Sonos screen is the same as is used on the RadioIO site. But the site has more context and content surrounding the station to aid choices. Certainly this can’t be done on this small a device, but some more thought here could help. They have a search, but it requires typing, and it’s slow. I want my music now! The weather channel is choice after choice of NOAA weather stations without any geographic cues in the titles. Tough. Wonder if you guys could turn the Sonos into a SAME early warning weather device. That would be very cool. All in all, if you are considering a music system for your home or apartment that works with your digital music library, look seriously at Sonos. I’m closing in on four years now and have never looked back. Yes, Sonos is premium priced, but in my opinion it’s worth it. From the products, to the service, to the seamless upgrades. They work hard at making it all come together.